Disney fans are famous for collecting things. Seriously, official Disney pins is an entire industry with a rabid fan base. Pin collecting is big enough that other parks are following their lead. There are ear hats, Vinylmations, popcorn buckets, and more all graced with Disney logos. A big part of the reason is Disney collectors spend money. As I sat in Betweenland recently, I pulled up several photos of long lines for Epcot’s 30th and heard the ringing of cash registers in my head. I really do not collect anything. Well that is unless you count books. Books don’t count right, those are educational. And I don’t think you can count T-shirts, coverings are a basic human need! So I have not really dived into any of the big collecting areas. I own no pins and there were less than five Vinylmations in our house, mostly baseball themed. Okay, I do collect themed baseballs, not exactly a high volume collectable. When they released Cars Vinylmations, they had my attention. First, Cars and Cars 2 are very popular in the Between House, especially with the Between Kid. 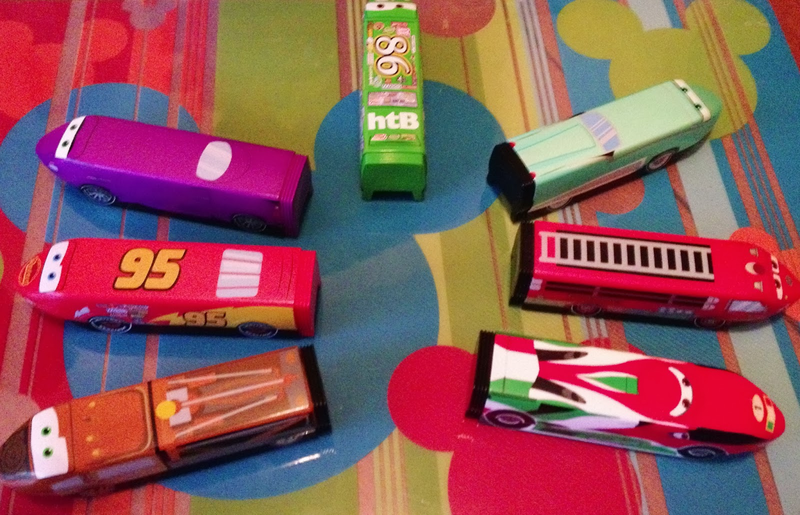 Second, they figures were shaped like monorails, which the Between Kid also loves. The Between Kid had to get these, but the question that I was left with was how? It was not like I could just drop into the parks and pick up a case to get the set. And there would be no opportunity to trade with other collectors, even if I understood how trading works. So I was convinced that I was going to have to spend a ton when we went on vacation buying a flat to get the whole set. I was wrong, we did not even need to go the parks. The figures were available as blind boxes at www.disneystore.com. I was somewhat hesitant to buy blind boxes online and continually drug my feet. But an email changed everything. There was a one day sale in which they sold the blind boxes for over 50% off. So I jumped online and bought 6 boxes, figuring that my $30 would be well spent if we got 4 non-duplicates. And was I ever surprised. They included a bonus Robot Series 1 Vinylmation for every Cars Vinylmation ordered. And most importantly, and results may vary, we received no duplicates in our blind boxes which included the chaser. With half of the set in hand, the next step was to find the half missing from the set. I was not willing to buy more blind boxes since the changes of duplication were high. So I turned to Ebay. And I watched Ebay over a period of weeks. By not just jumping on the first auction of those we did not have I was able to buy the remaining boxes at prices between $4.50 and $7.00 including shipping! For the Between Kid, this became a game as the Kid showed me the box pointing out the ones that dad still needed to get! So why this story, because it’s really not about the complete Cars Vinylmation set. Though it does look really good in a Cars themed room! No this is encouragement that you can collect your favorite theme park items here in Betweenland. Yes, this was not a limited edition set, but it was still relatively cost effective to put together this set without purchasing duplicates. Yes, if it was limited edition I am sure the Ebay costs would have been higher. But by being patient we were able to lower our own costs. In the world of Ebay if there is something you want there is a good chance someone is selling it. And www.disneystore.com does a pretty decent job of carrying parks merchandise, including limited time offerings such as my Space Mountain anniversary tee shirt that I love. No friends, feel free to collect those Disney items your heart desires, because in an online world your collectibles are just a click away. I'm Between Disney and I'm Monsters University! We now know where all the top scarers got their education! 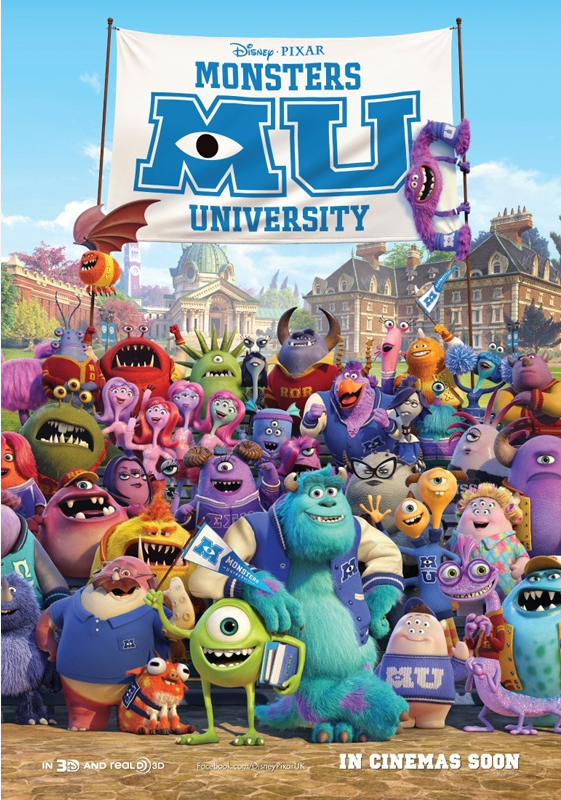 In this Pixar prequel, we follow Mike and Sulley as they start they scarer education at MU, Monster's University. Mike is a bright overachiever who knows everything about scaring. Sulley is the entitled scaring legacy, trading on his dad's name to get respect in the classroom. The two are thrown together, along with the boys of Oozma Kappa, in an attempt to win the Scare Game to keep their good academic status in the scarer program. Captain Tightpants: Nathan Fillion plays Johnny Worthington the president of fraternity Roar Omega Roar. I really did think he came across well as the charming and shallow villain. I could feel him channeling Captain Hammer through the character. I disliked him, and found myself charmed by him. Danny McGrath: Steve Buscemi returns as Randall, I mean Randy, Boggs. Randy seems like a nice kid when we first meet him. He reminds me of Benji from Pitch Perfect (though it is Terry/Terri voiced by Dave Foley and Sean Hayes who is an expert in close up magic). He wants to be liked by the cool kids, but some of his efforts like Benji's fail. You could see him becoming like Buscemi's Danny McGrath in Billy Madison, alone and slightly socially off if he had not made any friends. So when we see the angry Randall in Monsters, Inc, you really wonder what happened to this nice kid. Well, the good news is you do see way Randy got so angry. Animal House: The guys of Oozma Kappa are really likable. You will want to see they do well, and become popular. And in those scenes where they take a step back on the college hierarchy does make you feel for them. The OK gang along with Terry/Terri are Don Carlton, Art, and Scott "Squishy" Squibbles. I could really see doing a short series with the men of OK. That way they would not have to share the screen with Mike and Sulley. My one complaint is I really wanted a what happened to them montage, like in Animal House, telling me what happened to all of the boys. There is a slight hint to this at the end, but they do not fully commit. Old School: The settings are going to feel familiar to adults, who might be brought back to their college days. And the material of Monsters University is tough character driven stuff. Themes in the movie including transitioning into a new environment, fitting in, and choosing one's destiny in life. And honestly, for not all the characters in the movie do their dreams come about the way they envisioned. That is a tough reality for even adults to take. So I would say there was more to think about than to watch. There was honestly not continuous fast paced action. And I think this explains why the youngest member of the Between Family was not always engaged. The Avengers: As we were getting up the Between Wife asked me if there was anything after the credits. I said, "It's not The Avengers, I think we are safe to go." Well I was wrong. A theater staff member flagged us as we were heading out and let us know there was something after the credits. And honestly, it was worth going back into the theater to see. Crystal Palace: I do have to say that Billy Crystal and John Goodman really do seem to know Mike and Sulley well. It was liked they slipped on the old glove and it fit perfectly. It is almost like the characters are based on Billy and John! I was tickled that I found the John Ratzenberger cameo, which was classic as always. But I never did find the Pizza Planet truck. Though I think the inclusion of A113 is perfect based on its college origins. And there are some other homages to the other Monsters movie that will probably give you a light chuckle. I think Disney fans are likely to enjoy this film, along with the general public. And based on other movies I have seen this summer it deserved its smash opening weekend. Everyone who reads this blog, is probably going to see it in the next few months. Monsters University is a good movie, but not an instant classic. I just wish they would let me signup as a student! 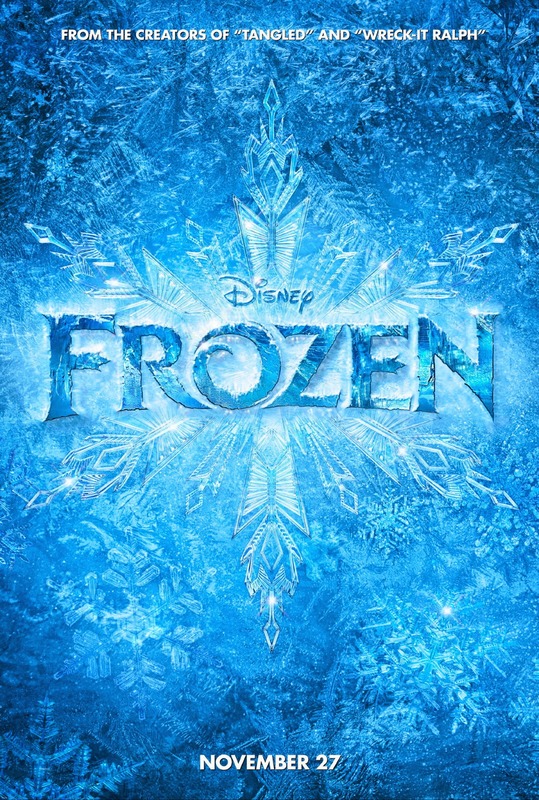 Disney has released the first trailer for Frozen to be released November 2013. This movie has had a lot of excitement and hype around it..so let's see if it lives up to it. You know what, I just feel like I have seen this before. Yeah it seems to be something like that. Scrat finds nut. Scrat loses nut. Scrat chases nut. But this time it is a carrot. The Between Wife says I am thinking too hard! The Between Tweens says it is cute. The Between Kid says, awesome. A faithful blog reader says, " I've heard the Ice Age comparison. I will agree they are similar but the other part of me knows that Frozen will...be nothing like Ice Age." 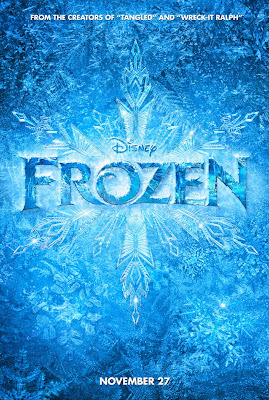 As one who was interested but not yet excited by Frozen, I have become scared for the production. Trailers should make you excited. For me this one just lands flat. And as someone who lived through John Carter, well trailers are important! Despite my current trend of disappointment with blockbusters this summer so far, I am really excited about Monsters University. I have faith that Mike and Sulley will turn it around! 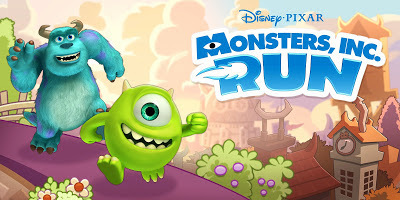 Unfortunately, the IPhone/iPad app Monsters, Inc. Run has done little to put me into a Monsters State of Mind. The concept for the game is pretty simple. 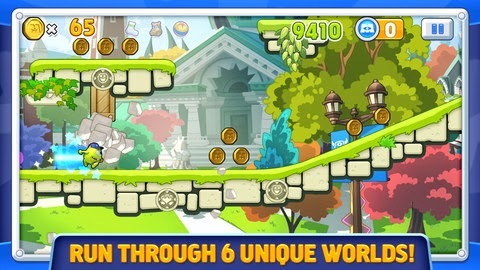 You start as Mike running from left to right on the screen filled with obstacles and bonuses. The character can move vertically in one direction and horizontally up and down. As you run you can pick up coins and may even hit power-ups that temporarily gives Mike special abilities or turn him into the taller and stronger Sulley. Also, those coins can be used to buy abilities outside of the game play for future use. Additionally, there are three bonus items hidden throughout each level. 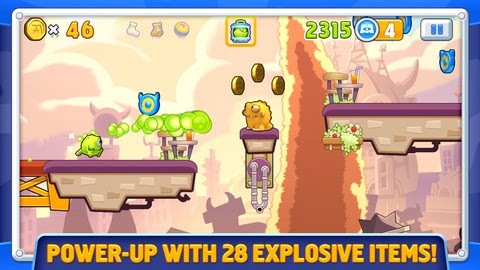 To complete each level, your monster has to reach the end without falling to its doom. Monsters, Inc. Run has never really worked for me, on an emotional level. I was drawn to it because I thought it would be another Disney branded version of Temple Run Brave. It is not. To me, the closet game I can compare it to is Super Mario Brothers for old school NES. In Mario a character could retry jumps simply by backing up within the visible game area. I find myself frustrated by my inability to back up three to four steps in Run to make a better jump or hit an angle that I missed. Additionally, you cannot stop Mike and Sulley from moving ahead during the game. I honestly would probably really enjoy a Mario game with its original aspects branded to Monsters over this similar, but frustratingly different game. I still stand beside the idea that a great way for Disney to market movies is offering cheap and enjoyable games applications. I really thought that Temple Run Oz was more enjoyable than Oz the Great and Powerful and the game made me want to see the movie. Temple Run Brave continues to occupy free time as I still replay it often. While, the Between Kids think that Monsters, Inc. Run is great, I have never stumbled on them playing it. Sadly, for me, Monsters, Inc. Run fell short in furthering my excitement for all things Monsters. Good thing I can still count on Mike an Sully!? I mean this movie cannot let me down right? The Unofficial Walt Disney World Earbook 2012: One Fan’s Review in Pictures by Kevin Yee is a pictorial chronicle of events at the Walt Disney World Resort during 2012. The book contains month by month chapters that provide visual representations of major events that occurred in the resort. Events covered include a multiple page spread remembering Snow White’s Scary Adventures which closed in May and the short-lived first version of Habit Heroes which was closed shortly after opening during to guest complaints. 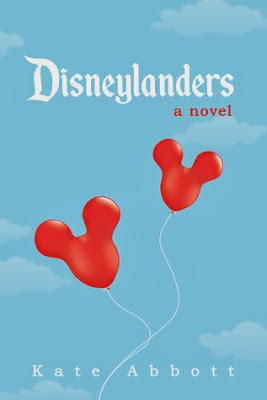 The book closes with an appendix that provides information about selected prices for accommodations and tickets during 2012, and prices for one day in June across the resort. Honestly, I did not know what I expected. 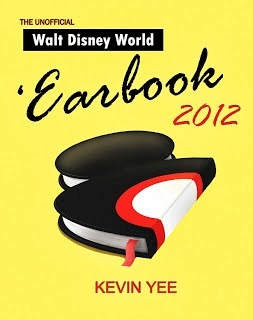 But I did not expect what I got, this text really is a yearbook for Walt Disney World. It is very photo based with a minimum of text. And it is relatively short, one can scan through this small book in less than 30 minutes. The pictures really are a star. And for someone who did not visit the resort in 2012 it serves as a visual resource to the events I did not take part in. The chapters vary by length with Snow White’s Scary Adventures in May receiving a five page spread, while the entire month of March only got 3 pages. But the length is likely determined by events which occurred. I wonder how the chapters will land for 2013 with Limited Time Magic. And I am guessing some events will not even make the pages of the 2013 edition. It is short on commentary. And I would have liked additional commentary for events like the closing of Habit Heroes’ first incarnation beyond saying it was criticized in the press. But again, one gets the sense this is intended to be a factual record not a editorial on the park. One thing that I really stands out in this book, especially being a self-published project, is the Index. So many small publishers/author published books lack an index. Earbook 2012 has an extensive and useful one. Earbook 2012 may not be a book for everyone. Some guests who visited the park in 2012 may wish to pick this up as a scrapbook of a year they visited the Walt Disney World Resort. Disney history fans may want to consider this as a reference with the pictures and price snapshots. And the other Earbooks when examined together could help tell the story of the changing resort. For me living in Betweenland, Kevin Yee gave me a glimpse of Walt Disney World from a year I never experienced in the park. Okay, you've probably noticed I'm pretty into Marvel. Seriously its not like I have started an entire podcast about my love of the Agent Coulson! Okay I Did! So the first major Disney/Marvel crossover happens this summer with Phineas and Ferb: Mission Marvel. Enjoy the recently released trailer with me. Personally I am a little nervous. But I think I would be more nervous if Mickey Mouse was meeting Wolverine. Let us be honest, pretty much anything is game in Phineas and Ferb's world! And I noticed the Beak on a second viewing, how great would a Beak comic be! So I am hopeful that with most this Agent P, this is really good and could lead to other fun crossovers. Hey...did I see S.H.I.E.L.D. Yes, yes I did! To provide a minor spoiler, I was saddened that the Iron Man 3 did not provide an overt reference to the villain Thanos. Since we were teased that Thanos was involved in the events of The Avengers I have assumed that he would return to the Avenger Initiative sometime in the near future. In fact I assumed that we will find that the movies of Phase 2 were all linked to Thanos, even if we are not shown the obvious clue in the first viewing of these offerings. 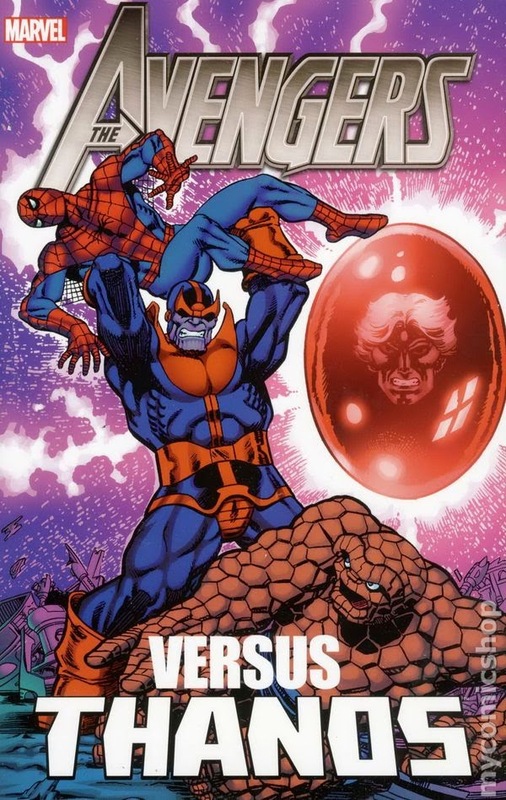 The number of Marvel Thanos related projects, such as Avengers vs. Thanos, helps reinforce to me that Thanos is coming and I want to know as much about this super villain as I can. Avengers vs. Thanos collects Thanos’ early appearances in the Marvel universe starting with Iron Man #55 in 1968 into appearances in the last 1970s. The stories frame Thanos as the conqueror of the moon Titan who seeks to expand his reach onto Earth. Amongst the tools that Thanos uses to implement his schemes are the Cosmic Cube. Readers also see a reoccurring pattern where Thanos uses people as puppets. Many of these stories go beyond Earth and have galactic settings as the scope of Thanos’ ambition grows. Throughout these stories Thanos fights the Kree Captain Marvel, Daredevil, Adam Warlock and the Avengers. Along with the introduction of Thanos the volume also introduces Drax the Destroyer and Gamora. My first thought is where are the Avengers? I think readers should safely assume, by the title, that Thanos will be fighting the Avengers team throughout the volume. This is largely wrong. For the bulk of this volume Thanos’ major opponents are either Captain Marvel solo or Adam Warlock. The inclusion of the Avengers of a team is rare, though Avengers like Iron Man may have solo adventures against the Mad Titan. Honestly, I think a better title would just be Thanos! But honestly that title probably would not get casual comic readers to grab it off the shelf in a bookstore, where a link to the Marvel Cinematic Universe and the Avengers would. I think one of the biggest revelations for me was that Drax the Destroyer was created solely to fight Thanos. And despite his non-human appearance, he is in fact a deceased human. This helps me understand why Star-Lord Peter Quill is able to get him to rejoin the Guardians of the Galaxy when he clearly does not trust Quill. He still has an attachment to his home. Also, in this volume we see the origin of another Guardian Gamora, who was raised by Thanos. However, her discovery of plans for a global genocide turned her away from her master. So to me this book supports The Guardians of the Galaxy film much better than it does Avengers 2. The stories themselves are products of their times. But I feel that they are good quality when compared against other stories of that era. The art also varies, but overall what is presented is good stuff. I would not call the book one of the greatest trades I have ever read. But I did think it was good. But I am glad that I borrowed and did not buy this volume since I am likely not to pick it up again. Thanos is coming to the Marvel Cinematic universe. While that Thanos will likely differ from the one in comics, Avengers vs. Thanos recounts the source material of Thanos’ early appearances including first instances of key Guardians of the Galaxy. The volume is definitely an interesting read from those wanting to prepare themselves for Thanos and his future confrontation with whatever Avengers are in the hero stable in the future. For more reviews like this about the Marvel Cinematic Universe visit www.welcometolevelseven.com.